A few months ago we reviewed Raiden Fighters Aces for the Xbox 360. It was a collection of "classic" Raiden Figthers games for the 360 with some incredible value. A few months later we have a full sequel to Raiden III on the same platform, one that's enhanced from the arcade version of Raiden IV. Not much has changed from the familiar Raiden formula and game style, but the biggest change that is immediately noticeable are full 3d graphics. Gone is the sprite based gameplay we've all grown accustomed to, in its place are some monumental looking environments and effects. Your purple laser never looked so good. For fans of the arcade game there's a classic mode included with sixteen levels, but the game includes the Xbox 360 mode with two bonus levels. As you continue to play you'll earn in game credits and save "checkpoints" so you can continue later on and replay from a certain part in the game. It's a nice addition for those that are unable to make it through with the given credits. As someone that's a Raiden veteran let me say - this is by far the hardest Raiden to date. The bullet patterns are brutal and the enemies are relentless. Thankfully there's three difficulty settings to help ease the pain. The best way to make things easier is to play the game in two player co-op mode. Bringing a friend into the action allows you to cover the entire screen with ease, mowing down enemies quickly and efficiently. While it seems easy at first, as the levels progress you'll quickly be swarmed by insane bullet patterns to dodge. 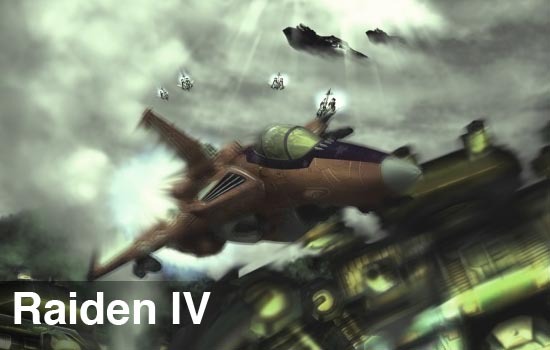 In fact, Raiden IV makes me rethink the definition of a vertical scrolling shooter as there isn't so much shooting as there is vertical and horizontal dodging. Lets face it, nobody really aims in these games, they simply are looking to avoid bullet patterns. Page created in 1.2864 seconds.